FL410201. Luftwaffe Einmannschlauchboot, model A-2 (one man dinghy). Manufactured in a yellow rubberized fabric with one inflatable buoyancy chamber and integral water pocket on the underside. In use this would fill with water and provide stability and ballast. Marked with user instructions/diagrams in German. This early production variant of the A-2 has pockets on the floor in which a collapsible baler cup or 'Schopfbecher' (FL45107) and sea anchor drogue or "Treibanker' (FL451006) were stored. 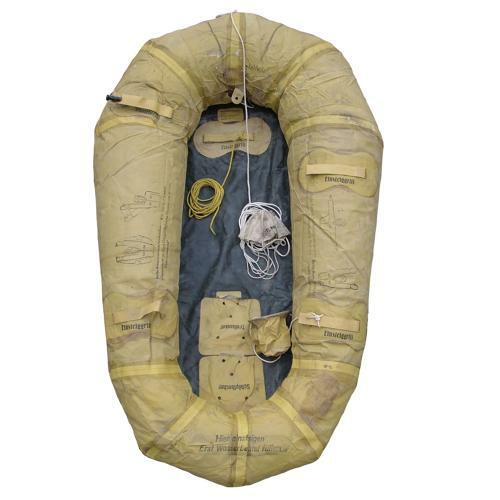 Both are attached to the dinghy via rope lanyards and in good condition. The dinghy also retains the CO2 inflation bottle sleeve and hessian cover (worn) but we have removed the bottle as it is not possible to post this overseas. The dinghy material is very sound, completely pliable and well marked. The rubber around the CO2 bottle attachment point is slightly damaged but remains flexible. The dinghy inflates but does not hold air for long at all so either has a leak or hole but I can see no obvious damage. The dinghy also comes with the 1943 dated card instruction/inspection booklet. Unfortunately this has been wet and cannot be opened but some information can be made out on the front and rear (diagram to rear). These dinghies are normally associated with fighter pilots and are now extremely rare to find in this very good condition. Further photographs available on request. Stock code S23094.